Where did the bombs land? One landed on the back of Glenshaw Mansions, one next to Christchurch, one on top of 2 and 4 South Island Place and the other in the middle of Offley Road. Anaise Marie Lakeman 62 Widow of J Lakeman. Died at 4 South Island Place. 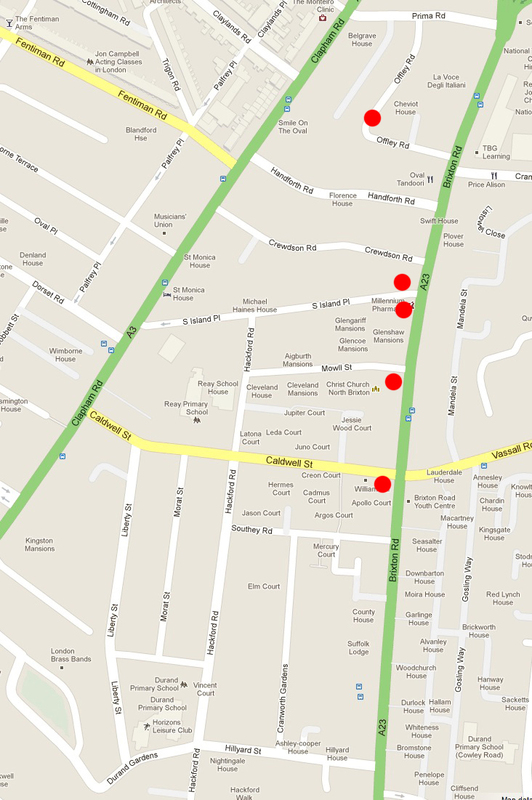 Position of Occurance Glenshaw Mansions, Brixton Road. Notes Lamp standard destroyed. Bad escape of gas. 28.12.40 01:36:AM No's 2 & 4 South island Place between Brixton Road and hackford Road. 21:00 hrs. High Explosive. Casualties - 3 dead, 2 injured. Suspected that 1 child is still in wreckage of No.4. R.P still in attendance. Homeless taken to public shelter in vicinity. The incident has also caused some damage to No. 's 5 & 7 Crewdson Road. C.D.P required. Bodies at 7 Crewdson Road. 28.12.41 1:39 AM Offley Road between prima Road and Brixton Road. No's 44 & 46 partly demolished. Lamp standard in street destroyed. Crater 8ft in diameter, 5 ft deep in footpath and roadway outside no's 44 & 46. Homeless accomodated in public shelters in vicinity. 28.12.40 3:25 AM Supplementary Report 2 & 4 South Island Place. The suspected child that was under the debris has been uncovered from No.4 making the total casualties 4 dead in this incident. All four bodies all now at No.7 Crewdson Road. This incident now closed, all services have returned to depot. 28.12.40 7:50 AM We cannot ascertain at the moment exactly how many people will be homeless resulting from last night's incidents in this area. When we have collected all those together please will you inform me where they are to be sent. Five are already at this post. Approximate number should be given as soon as possible. Kennington Road School will probably be the centre but please inform before you send. 28.12.40 9:28 AM We are reporting 4 homeless persons. Mrs Burgess - 9 Crewdson Road. Mrs Gollop 5 Crewdson Road, Miss Gollop 5 Crewdson Road and Mr Gollop 5 Crewdson Road are being sent to Kennington Road School. 28.12.40 10:12 AM Reporting 2 homeless. Mr F Rogers and Mrs Rogers of 46 Offley Road who we are sending to Kennington Road School. 28.12.40 10:30 AM On advice from R.S.P we are reporting chimney stacks in very dangerous condition at rear of 4 South Island place and 5 & 9 Crewdson Road. 28.12.40 13:34 PM One homeless. Mr G Dunmill of 9 Crewdson Road. 28.12.40 15:40 PM Reporting two homeless. 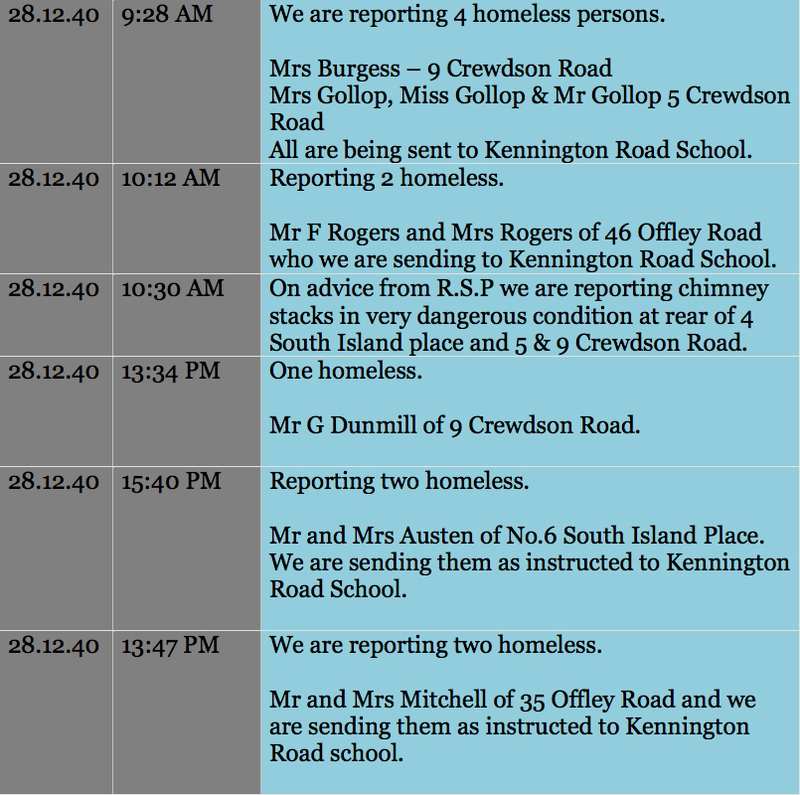 Mr and Mrs Austen of No.6 South Island Place, We are sending them as instructed to Kennington Road School. 28.12.40 13:47 PM We are reporting two homeless. Mr and Mrs Mitchell of 35 Offley Road and we are sending them as instructed to Kennington Road school. 28.12.40 01:38 9-16 Glenshaw Mansions, Brixton Rd between South Island Place and Mowll Street. 21:00 hrs. High Explosive. Considerable damage done to this block of flats including shops underneat. Police and home guard are patrolling this area as looting from shops was reported. 28.12.40 01:45 Christchurch Mowll Street. 21:00 hrs. High Explosive. Bomb crater in forecourt. Casualties - Nil. Area roped off with red hurricane lamps. Normal except for debris. RP/R required for cleaning debris. Incident Closed. 28.12.40 09:39 Supplementary Report. Caldwell Street, Brixton Road. 21:16. High Explosive. Bomb exploded on contact with roof demolishing half the top of one building and half the top of another. Buildings damaged, United Dairies completely uninhabitable. Open to the weather - Russell Public House - roof partially destroyed, other parts unsafe. R.S.D needed to shore up and also to remove debris. No Roads blocked once R.S.D have cleared up. Incident closed. 28.12.40 11:41 Re: incident Caldwell Street 21:16 27.12.40. Am still waiting on R.S.D. People using public house in danger of injury from falling masonry, this matter is urgent.